Below you will find Helpful Sewing Information which includes stitching how-tos such as the overcast and blanket stitch along with hints and tips specific to sewing. I will be adding information to this category on a regular basis so please check back frequently. I hope you will use this as an important and useful sewing reference. **Overcast or over edge stitch is when you come up from the bottom with the needle through the fabric then bring your needle up from the bottom again right next to the first stitch continuing in this manner with each stitch coming up from the underside of the fabric. 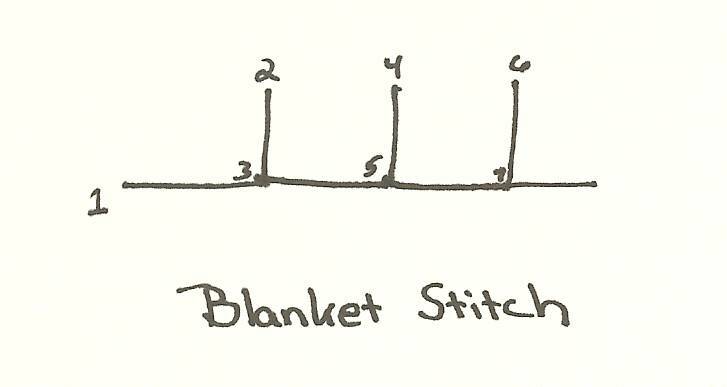 **Blanket stitch: Come up at 1, go down @ 2 and come up @ 3 being sure to catch the thread from your first stitch. Pull taut before beginning your next stitch and be sure to keep your stitches even. Baste - To baste is to make temporary stitching using long loose stitches that will be removed once your garment (or other stitched item) is complete. Bias - The diagonal direction of fabric. Fabric stretches on the bias. Gather - Gathering is a process used to fit a larger piece of fabric into a smaller piece as in the waist of a skirt. To gather you make two or three loose rows of stitching then pull or gather the fabric along these stitch lines. When done on a sewing machine, set your stitch length to the longest stitch and loosen the top thread so it will gather easily without breaking the thread. Right Side - The front side of your fabric. The side that is intended to be seen when your project is finished. Running Stitch - A row of short even stitches made by passing the needle in and out of the fabric. Seam Allowance - is the distance between the cut edge of the fabric and the line of stitching. Selvage - The edge of fabric which is finished by the manufacturer to prevent raveling. This is cut off before sewing with this fabric. Tension - The balance between the needle and bobbin threads (how tightly they pull on each other). An even balance or tension makes for a perfect stitch. Top Stitching - A line of stitching done on the right side of the fabric used to reinforce a seam or add a decorative finished look to your project. Wrong side - The back side of your fabric. Not the side that you would normally see. When turning a fabric tube right side out - attach a safety pin to one end of the tube and close the pin. Insert the pin, while it is still attached, into the tube and push the pin through to the other side. The fabric will follow and your tube will now be right side out. When teaching children to hand sew - I find it helpful to use safety pins and place them all on the same side. This way as you instruct them in sewing, if they always keep the pins facing the ceiling, the piece won't get all twisted and the thread won't get knotted as often. When hand sewing - if the thread (or yarn) becomes twisted just drop the needle while holding onto what you are sewing and it will unwind itself. When kids want to learn to sew with a needle and thread - Felt is the perfect fabric to start with as the edges don't fray and the needle glides through easily. When threading ribbon or elastic thru a casing - attach a safety pin to one end (be sure to close the safety pin). The pin will be easier to push through the casing. When sewing with a sewing machine - to make a knot, take 3 - 4 forward stitches then go backward 3 - 4 stitches and start stitching forward again. This will secure your thread so it doesn't come undone.